Here’s a great deal on a versatile, multi-purpose pack that should suit the needs of tactical guys as well as game hunters. Right now Cabelas.com has genuine CamelBak® UpRoar packs on sale for just $29.88. The regular price on these packs is $99.99, so you save over seventy bucks. With a 1,710 cu.-in. cargo capacity, the Uproar pack (Cabela’s item OG-580060) can carry enough for a full day in the field. And of course, since it’s a CamelBak®, the pack totes plenty of H20 via a 24 oz. fitted water bottle (NOT a bladder with sipping hose). Other features include: goggles pocket, organizer pocket, laptop sleeve, and gear-attachment lash points. 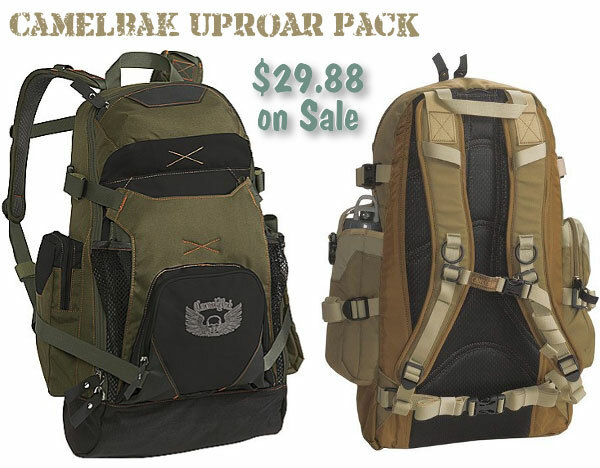 The discounted UpRoar pack is offered in either olive drab with black accents, or black with blue piping (the Coyote tan color shown at right is NOT on sale). This pack is well-designed, with a comfortable surface next to your back, and ergonomically curved shoulder straps (complete with sternum bridge strap). NOTE: This pack carries H20 in a plastic water bottle in a fitted side pocket. Unlike most other CamelBaks, there’s no internal bladder or hose, so you’ll have to reach around to get your water. Share the post "CamelBak Pack on Sale at Cabela’s for $29.88"